SIMPLICITY SERF 515 (No. 990418) Above has a 5 hp. Briggs & Stratton engine. 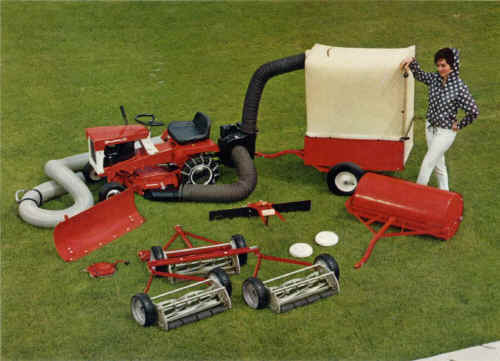 Shown with 28" Rotary Mower (No. 990442), which mounts to front axle and tilts to ground contour preventing scalping. Mows up to an acre an hour, adjusting to cutting heights of 1-1/4" to 3-3/8"". Attaches with just two pins. SIMPLICITY engineers want you to pick your power, allowing you to choose the unit that fits your exact requirements. 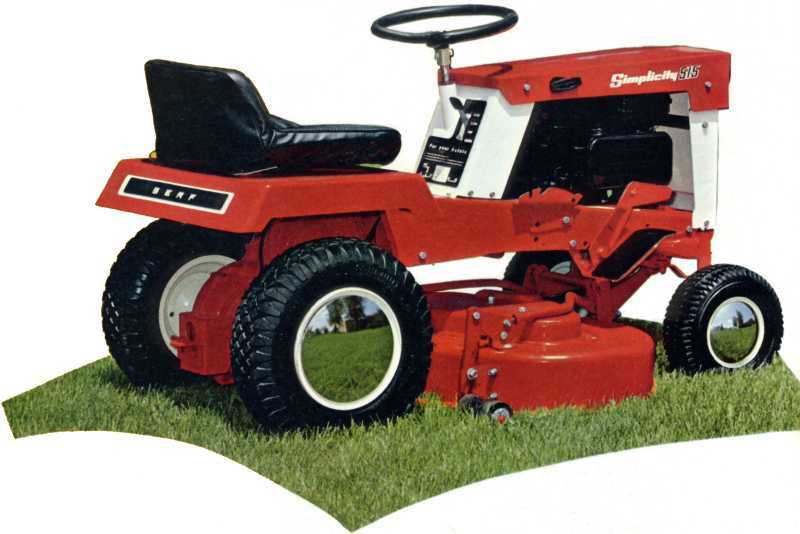 This all-new 5 hp Serf is a perfect example. While it's not quite as brawny as the 6 hp Yeoman, it does many of the same jobs. It handles a 28" rotary mower, a 40" grader blade, the 36" lawn roller, and, if you wish, moves right out with the 3-gang mower, leveling a 5 ft. swath. One of its nicest features is its compact design. It has a 20" turning radius. You can store it in about the same space as a coaster wagon--it's only 26" wide and 511/2'' long. But don't let that size lead you to underestimating its capabilities. This versatile unit quickly converts from lawn mowing to grading, snow-plowing, hauling, lawn rolling and to vacuum cleaning your yard. The Serf features two speeds forward and one reverse, with speeds ranging from 2.3 mph to 3.5 mph. By adding the optional low speed kit, you can have four speeds forward and two reverse, reducing the original speed of each range by one-third. The Serf's rotary mower, like other Simplicity mowers, gives you that careful cut, with full assurance that you won't cause "bald" spots here and there. The "free floating" feature really works -- because this is the Simplicity patent that's been proven over the years on all Simplicity tractors. While compact, this Serf is as sturdy as a small tank, with electrically-welded all steel construction. It's gentle and maneuverable and has a 20" inside turning radius that lets you easily trim around trees and close to the swing set. This eager helper mounts any of its attachments in less than a minute. This all-new Serf really does the job. Specifications of Engine: Briggs & Stratton 5 hp, 4 cycle, single cylinder, vertical shaft, air cooled engine built to Simplicity's specifications; Features "Easy-Spin" starting with self-lubricated starter clutch; Has oil foam air cleaner, and has gear impeller lubrication system, with an oil capacity of 1-3/4 pts. ; Adjustable mechanical type governor, running in oil Piston displacement: 12.57 cu. in. Bore and stroke 2-9/16 x 2-7/16. Specifications of Unit: Constructed of heavy gauge channel steel, featuring controlled traction, a friction mechanism which provides driving torque to both wheels, yet retains differential action when one wheel slips; Two speeds forward and one reverse, ranging from 2.3 mph to 3.5 mph; Optional two speed kit provides four speeds forward and two reverse; Foot operated brake-clutch combination; Deluxe leatherette foam rubber seat; Pneumatic tires, front 4.00 x 6 x 11.00, rear 4.80/4.00 x 8; Has airplane-type steering wheel, lever and drag link combination.